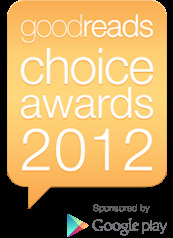 The Goodreads Choice awards for 2012's best books nominees are in - have you voted? As so often happens when books are discussed, I have opinions. And since I have this handy-dandy book blog at my disposal, I'll share them here. In Mystery & Thriller, I voted for Gone Girl by Gillian Flynn. This book is my Jerry Maguire - it completes me. I can only repeat myself from my post in August: READ THIS BOOK. Now, I loved the new French book (though I still like Faithful Place best of all of hers), and am eager to dive into the new Penny (I fall deeper and deeper for Gamache with every volume), but I was disappointed with the pacing of the new McCall Smith. And oh, Historical Fiction. Such a glut of goodness. I loved the Mantel. The Faye was great. I'm in the midst of reading the Stedman, and have been truly transported in time and space by it. The Edugyan and the Morton are in my TBR pile, smiling at me with promise. The Livesey is another I've heard so much about, and plan to get my hands on soon.